Whoa, in this case it really is! Complete with lightning and thunder that is shaking my little home. The monsoon rain is pouring down, bringing much relief to our desert climate here in Sedona, Arizona. I was thinking of that famous quote, “Not all medicine comes in a bottle.” To me, one of the biggest and best tonics is laughter, especially shared with good friends. Have you taken the time to laugh today? It’s good to keep it all in perspective and find the lighter side to our own foibles and the strange circumstances Life can sometimes throw us into. One of the biggest jokes on us hapless humans is the seeking for “perfection” – a goal that is like sand slipping through of one’s fingers. Putting the pressure of the need to be perfect on one’s self is the doorway to much unhappiness and suffering. That is a state that simply does not exist here in the relative world, the three-dimensional existence we are walking through during our journey on Earth. Learning to accept ourselves and others is one of the valuable steps of growth that age can bring us…if we let it. If we think of the people we love the most, we can objectively see their imperfections and love them anyway, right? So why not apply that same unconditional love and acceptance to ourselves? It’s certainly easier to see the humor in daily life and have more fun and joy, when we do. The time is now to be happy. It is important to find the spiritual gift in every situation. To be happy, it is most important to find your purpose, and then live it. 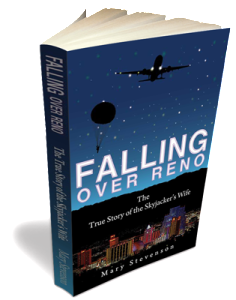 Well, my big, exciting news is that the “hard launch” of my book Falling Over Reno: The True Story of the Skyjacker’s Wife will happen this Thursday, August 27, for a six day blitz of publicity. Since the Ebook version was published on Amazon in mid-August, it has already reach the #16 best seller spot on Kindle’s list so I am over the Moon happy about that. Finding my voice and letting the words of my heart flow through my fingers and onto the pages of my book, has been a big jump into my life purpose. Allowing ourselves to finally express things we have long held inside is so liberating. Thank you to my readers who have given me those five-star reviews and I would certainly appreciate many more of those as others find and read my book. I am much obliged if you share this post with your friends as every Ebook purchase or even click onto my title on Amazon, will help me reach my goal to be #1 Best Seller in my category!